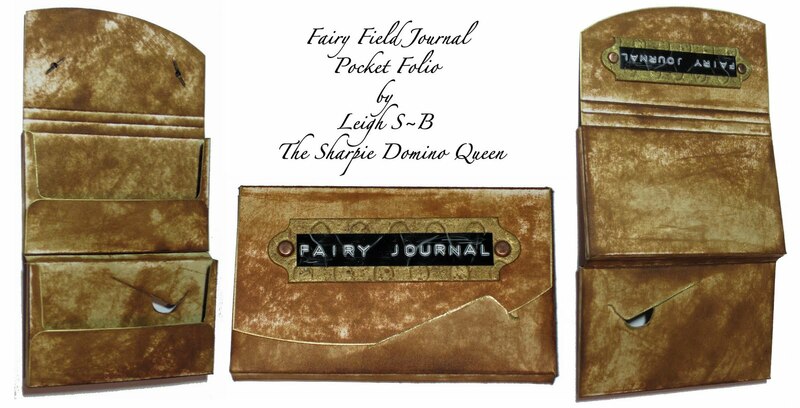 Velvet Paw Creations: Pocket Fairy Field Journal featuring rubber stamps available from About Art Accents! 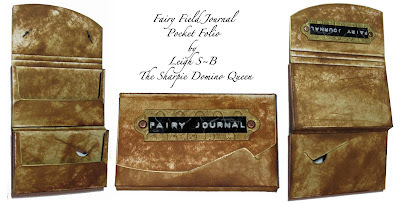 Pocket Fairy Field Journal featuring rubber stamps available from About Art Accents! I super excited to share this project I designed for About Art Accents. This one is for all the Fairy watchers out there, you know who you are ;-) This little Pocket Journal is perfect to keep with you at all times coz you just never know when you might spot a rare Flower Fairy out in the field and need to jot down notes and make sketches on the back of the enclosed Flower Fairy Note Cards! 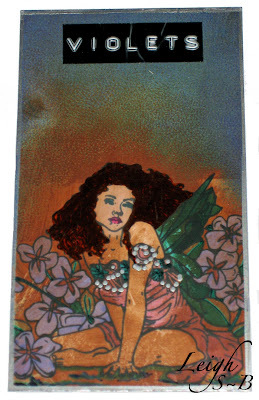 I was inspired by the gorgeous fairy rubber stamps available from About Art Accents and the wonderful packaging that Stride gum comes in to design this project. I was very excited to then discover that a box of business cards I have in my stash for altering fit perfectly into the slots of the gum packaging! Once I had what I needed I pulled the gum packaging apart so I could reverse engineer the construction and make my own template. I plan to re-use the actual packaging for a future project coz it has a wondeful minty scent ;-) Once I had the template ready I cut the Pocket Folio out of white cardstock. Scored all the fold lines with a bone folder and stained it with Distress Inks to age it. I used Vintage Photo first and went over that with Old Paper and blended both into the cardstock with a sheet of Bounty paper towel. I then edged parts of the Pocket Folio with a metallic gold paint pen. I folded and assembled the Pocket Folio with double-sided sticky tape once the inks had dried. 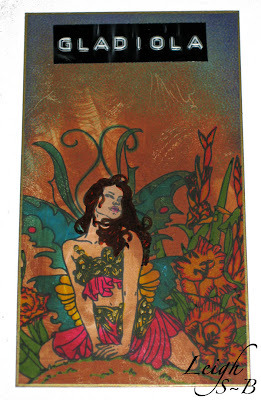 I then coloured a T!m Holtz Elements Grungeboard label frame with a metallic gold paint pen and aged it a bit with some Vintage Photo ink. Once that was dry I marked the placement of the holes on the Pocket Folio lid and used a small hole punch to make the holes and attached the label frame to the Pocket Folio with two mini copper brads. I then made the label with a Dymo Label Buddy. 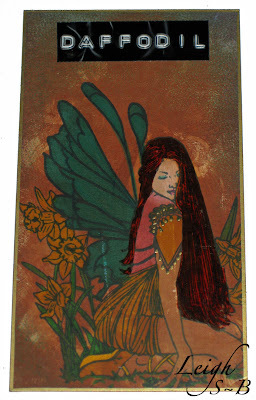 I then moved onto creating the little Field Note Cards for each Flower Fairy. The business cards I used are made from glossy cardstock. 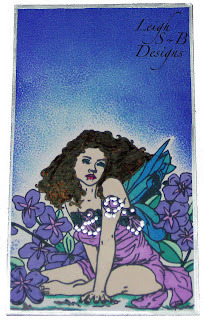 I stamped the fairy images with Memento black ink and coloured them with a variety of Sharpies, Marvy Brush, Le Plumme and Tombow markers. 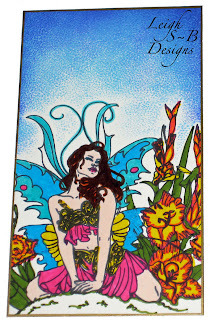 The sky background was created by stippling on the Marvy marker inks with a Stampscapes Tonal Applicator*. 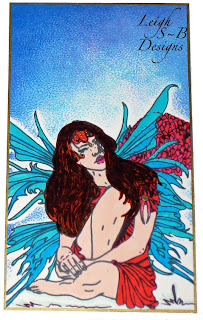 I added little details to each design with either a silver or gold extra-fine metallic paint pen. 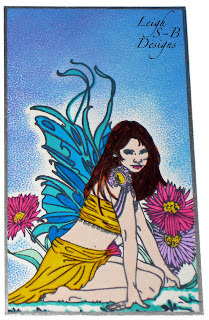 *TIP: When I stamped the fairies onto the business cards I then stamped the images again onto a piece of printer paper and cut out 'masks' for each fairy. 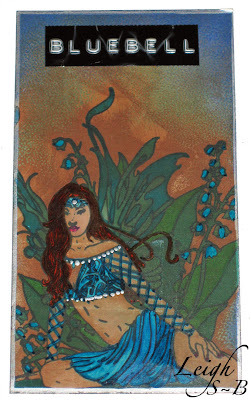 I then used the masks to cover the fairies while I stippled on the background inks. I then ran the cards through my Xryon to add permanent adhesive and adhered cream cardstock to the back of each one (covering up the business card info). 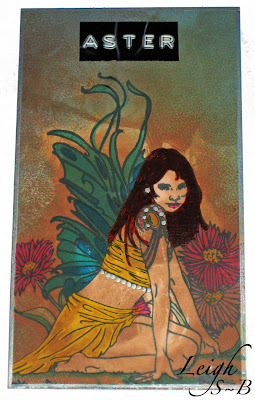 Once that was done I edged some of the cards with a metallic gold paint pen and the remainder with a silver paint pen to correspond with the metallic details I mentioned above. 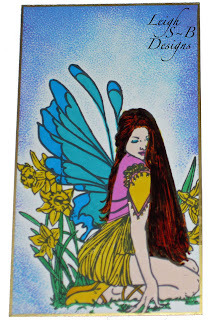 This next step can be quite scary so I included a few photos below to show you what the Fairy Field Note Cards looked like before I aged them. 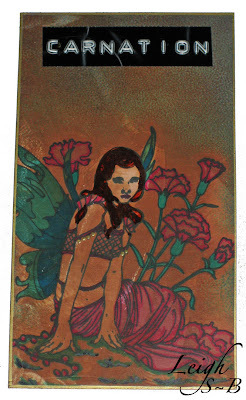 I aged the cards by smearing Distress Ink Vintage Photo directly onto each card and spreading it around with a piece of Bounty paper towel and then did the same to the backs. 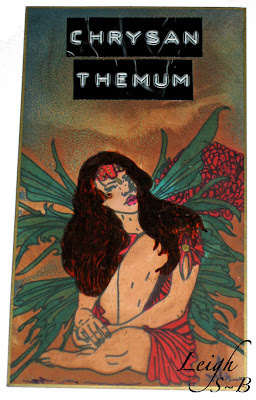 I finished off each card with a Dymo label showing the name of each flower fairy. This is what they looked like before taking the 'Aging' plunge! I've entered my project in the Grungy Monday 16 Challenge over at Studio L3! Hi Leigh, I love both the looks, the aged and the bright colors of before aging. Hope you have been well. Leigh - Beautiful project - thanks so much for the detailed directions! Leigh, this is an absolutely fantastic project, and a brilliant approach to the grungeboard challenge! 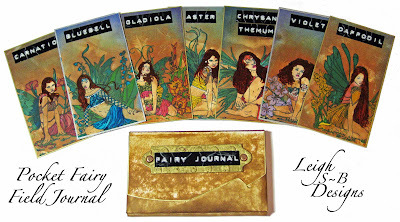 The card holder is fabulous, and the cards themselves are just gorgeous. Thank you for showing the difference a little Vintage Photo can make-- what a dramatic change! 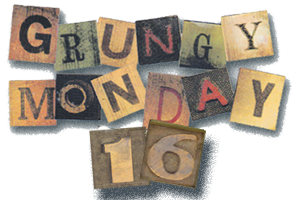 I'm just delighted that you shared this at Grungy Monday-- it's a masterpiece! Proud to be a part of Blockheads New Design Team!